…carbon roof, one-of custom paint tailored to enhance all design features on The Garia, two-colored hand-stitched luxury seats, alcantara roof lining and numerous hand-made details to create a truly unique luxury golf car. The base price for a Garia starts at $17,499 / €13,999 (excl. delivery and taxes). Luxury upgrades includes a built-in refrigerator and an exclusive personalization program where you can choose to have The Garia painted in your favorite color or matched to your other cars. Built to the highest standards of the automotive industry The Garia features a double wishbone front suspension similar to those found in sports cars and inspired by Formula 1 cars. The drive train is built by an Italian company that also produces Ducati gearboxes, and the aluminum profiles in the frame are made by the same company that supplies aluminum profiles to Aston Martin, Jaguar and Volvo. Phillips Develops Crosswalk System For Silent Vehicles – Phillips is developing an LED based crosswalk lighting system to warn pedestrians of approaching but silent vehicles such as electric buses, autos and scooters. The embedded LEDs react to approaching vehicles the same way traffic lights do by changing color from green to amber to red. Specialized Agriculture Applications – Oregon based manufacturer Barefoot Motors is selling electric utility vehicles for use in orchards. Karen Lewis with Washington State University Extension in Ephrata, Wash., said many orchard owners are shifting to a two-dimensional and three-dimensional row setup, enabling human or robotic hands to access the fruit by any type of technology. They are looking for smaller, electric utility vehicles to harvest or apply pesticides, she said. …provide students with a range of brand engagements creating a motivating product trial platform while generating buzz. Utilizing a branded Airstream trailer and two battery-operated GEM cars, (Global Electric Motorcars) trained product specialists will invite students to use mobile face washing stations featuring Go 360 Clean, enjoy two-minute upper back massages and a professional makeup application. GoatorMoto Utility Vehicles reports selling 50 Electro Transport Buddy 15 Passenger LE’s to the Al-Azzouni Group in Saudi Arabia. 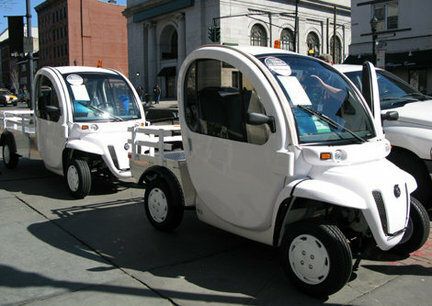 The electric powered shuttle vehicles were used in the recent Mecca Festival. Original posting about the project. AmSafe Seatbelt Airbag inflates in less than 90 milliseconds and, unlike automotive airbags, safely deploys up and away from the occupant, making it a safe restraint for passengers of all ages. Tomberlin management hopes the additional safety feature could lead to the establishment of a new class of vehicles with less restrictive regulations compared to highway speed combustion engine vehicles. In the past, Tomberlin has been a strong advocate for a Medium Speed Vehicle classification, which NHTSA has resisted establishing in large part due to safety concerns. GatorMoto now offers a back up camera option for all their electric vehicles. These systems can either be hard-wired or wireless, depending on your requirements. They feature a 7″ TFT-LCD monitor that can also be used for DVD/VCD/TV/GPS, a multi-function remote control and a camera with infrared night vision capabilities up to 10-15 meters. The equipment is waterproof, damp-proof, anti-fogging, quake-proof, high voltage surge proof, and high temperature resistant. They are suitable for all weather conditions. The hard-wire version costs $359 and the wireless version $459. The company promotes the camera as a safety option for parking shuttles, touring vehicles and delivery vehicles.